My maternal grandfather died when I was young, so I never got to talk with him about the Johnstown Flood, reportedly one of his favorite discussion topics. (I have no idea why he was so interested in this disaster.) I wish I could talk about it with him today, because now that I have learned a little about it from The Flood Disaster, by Peg Kehret, (1999, 160 pages) my curiosity is piqued and I’d like to find out more. How do people recover when their whole town is basically washed away? Of course, we can expand our knowledge about human resiliency by learning about the tragic Asian tsunami of 2004. Warren Spalding and Betsy Tyler have decided to use the Instant Commuter one last time to travel back to the Johnstown Flood of May 31, 1889, and fulfill a child’s dream before her life is ended. But when the little girl clings to Warren and Betsy as they return to the present, how can they take her spirit back to her own time knowing that death awaits her? I was looking for a quick engaging read this weekend. Having enjoyed The Volcano Disaster and The Blizzard Disaster, also written by Ms. Kehret, I assumed I would enjoy her third disaster book in the series, and was not disappointed. The action gets underway quickly as sixth graders Warren and Betsy get assigned in class the subject of the Johnstown Flood. It’s a no-brainer for them to use their handy time travel device to experience the event first hand. The book alternates between chapters about these two, and a family in 1889 who is experiencing the flood. There is just enough time travel, and within that time travel there is just enough trying to change the past (not trying to save the world) for my taste. As in the other books, the author picked details to describe the characters that made me like them immediately. It’s a fast moving plot and the stakes are high. While I was pretty sure Ms. Kehret wouldn’t kill off the main characters in a middle grade book, I wasn’t sure about some of the other characters and a cute dog, so I was on the edge of my seat to find out their fate. 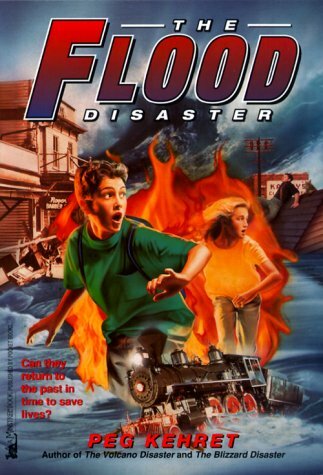 Like the other two disaster books, this one would seem a good choice for reluctant readers. The story is full of examples of people helping others including perfect strangers which was somewhat inspiring. This entry was posted in Book reviews and tagged Book reviews, kids' time travel stories, middle grade fiction, Peg Kehret, The Flood Disaster, time travel books for children. Bookmark the permalink. Sounds good and the cover certainly is an ominous warning of things to come. I’ve read several of Kehret’s books (Runaway Twin comes to mind) as she has been writing for quite a long time. Thanks for featuring one I had not read. Greg, I want to read more of her stuff because I like the simple, straightforward way she has of telling stories. Thanks for sharing…I have read other books from this author but not these. I must use this summer (and the library) to check them out. Deb, They are quick and fun! I hadn’t heard of these books. Sounds like something my grandkids would like. The story of the Johnstown Flood is an amazing one. Thanks for telling me about this one. Rosi, I knew literally nothing about the Johnstown Flood before I read this book. It is interesting. Disaster books always seem popular with kids! I’ll have to look for this one. I couldn’t find an email for you, so I hope you don’t mind my posting this here. My name is Laurisa Reyes, and I am the Editor-in-Chief of Middle Shelf, a digital book review magazine for kids. In each bi-monthly issue we recognize blogs that exhibit the spirit of middle grade books with a Best of the Blogs Award. Times Travel Times Two has been awarded in our July/August issue. You will find your blog noted on page 51. Also, please find attached an award button to display on your blog if you wish. Wow, I’m honored–Thanks, Laurisa! What a cool magazine Middle Shelf is. I don’t see the award button, tho’.